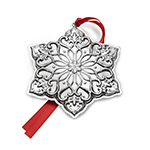 The annual Sterling Silver Wallace Candy Cane Ornament began in 2008, and each year is styled after a different pattern. 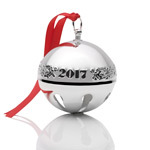 Now in it's 10th Anniversary Edition, the annual 2017 Wallace Sterling Silver Candy Cane ornament is just as beautiful as the first. The pattern for this year is Coburg. 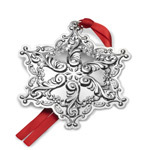 This limited edition collectible is a beautiful adornment for any Christmas tree or mantelpiece. Made in the USA. Includes a gift box, protective velvet pouch and is dated with the year 2017. 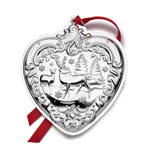 Candy cane ornament measures 4-3/4 inch high x 1-3/4 inch wide. The 2016 Wallace Impero Sterling Silver Candy Cane is still available!